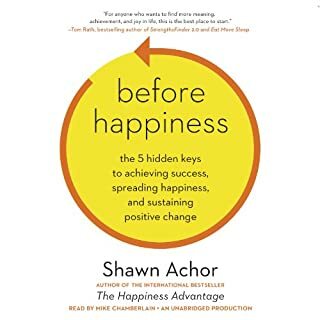 In his international best seller, The Happiness Advantage, Harvard-trained researcher Shawn Achor described why happiness is the precursor to greater success. This book is about what comes before both. Because before we can be happy or successful, we need to first develop the ability to see that positive change is possible. Only once we learn to see the world through a more positive lens can we summon all our motivation, emotion, and intelligence to achieve our personal and professional goals. In Before Happiness, Achor reveals five actionable, proven strategies for changing our lens to positive. 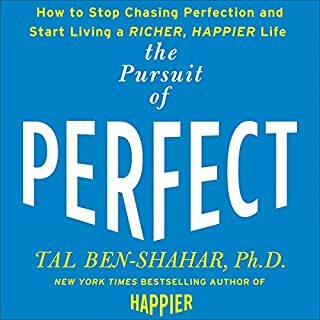 Worthwhile but no "Happiness Advantage"
Applying cutting-edge research in the field of positive psychology - the scientific principles taught in his wildly popular course at Harvard University - Ben-Shahar takes us off the impossible pursuit of perfection and directs us to the way to happiness, richness, and true fulfillment. He shows us the freedom derived from not trying to do it all right all the time and the real lessons that failure and painful emotions can teach us. 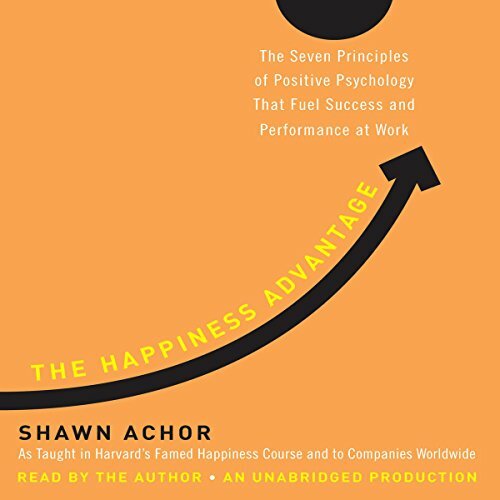 The Happiness Advantage: The Seven Principles of Positive Psychology That Fuel Success and Performance at Work (2010) is a best-selling book by Shawn Achor which posits that happiness is a precursor to success. Achor outlines practical steps that individual workers and team leaders can take to increase the odds of positive outcomes and professional advancement.... Purchase this in-depth analysis to learn more. All of us constantly broadcast information to others, even when we don't say a word. Sales professionals broadcast to potential clients in a way that wins new business. Managers broadcast to their teams about projects. Colleagues broadcast to one another about available resources. The messages we choose to broadcast shape others' beliefs in the potential for success and their ability to create positive change. This book is responsible for changing the way that people from all over the world conduct their lives and careers. This book starts out with Shawn explaining his experience at Harvard University. He explains how his gratitude for being able to attend one of the best universities in the world caused him to fall in love with the school. Looking back, he was able to determine that his experience at Harvard was significantly impacted by his enormous sense of gratitude for being selected to attend. I liked this book. It really presents the "act as if" mentality and has numerous ideas and behavioral suggestions to increase your feelings of well being. I did think that much of the focus was on the work place. If you are a stay-at-home worker you can still use the info but not everything actually pertains to your situation. However, the studies and insights are still really interesting to hear about. A positive listen about choosing to be happy. For me the book is a long winded pitch for the DVD and/or consulting. It's a solid premise and yes its based on the latest research but it doesn't offer the concrete "how to" I would have liked. I had watched the TED talk and loved it, purchased the book and didn't really feel any better equipped on how to put it all into practice. Cue a lucrative consulting arrangement or DVD sale for Shawn. This is an excellent book. It teaches that to be successful you must first be happy and not the other way around. We do our best work and are more productive when we are happy, And our happiness expands to everyone around us, including "the mother of your kid's best friend". The seven principles are concrete steps to make us (and everyone around) happy. The book is easy to read/listen and is well researched. Give this book a try. You won't regret it! Shawn Achor provides an overview of positive psychology and offers seven principles of positive psychology which contribute to individual success and personal performance. Over the years, many have sought to promote positive thinking. Prominent among them is Norman Vincent Peale for example. However, scientific research of late has begun to support the views of positive thinking and the benefits that can be derived from nurturing such a point of view. 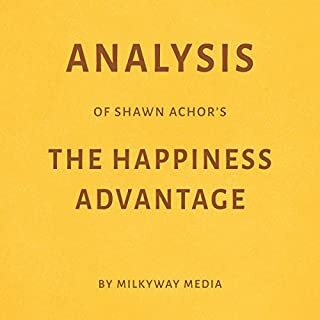 In this book, Shawn Achor aptly presents to the layperson findings in the related field of positive psychology. This is definitely informative . Achor offers strategies that the listener can implement immediately. The section on the “Tetris Effect” was the most helpful to me. It helped me understand where habits come from and how we can get “stuck” in particular ways of doing things and harbor attitudes unconsciously. The book is well written, easy follow, entertaining and informative. It is readily available to the uninitiated as well. The author reads his own work and does an admirable job of it as well. I found this book entertaining and reassuring. That happy people are more successful isn?? ?t surprising to me, but the fact that we can all be happier than we are is extremely encouraging! Before this book was over, I was already using the information in my own life and had I feel amazingly good. A great combo of research and tools for success. I do not deny that most of the claims made by this book are likely true. But the claims are repetitive both from other self-help books and within this single volume. Additionally, the claims are very basic - being optimistic will make you more successful, see the world not through rose colored glasses, but rather through rose *tinted* glasses. Many studies are fundamentally explained and many stories are told, but there is no depth in any of them. If this is your first "self-help" book, then it might help you quite a bit, but if you have read anything on brain behavior, motivation, or psychology, I doubt you will get much from this book. I also feel that there is a fair amount of self-aggrandizement as he refers to his many talks given to Fortune 500 companies. It is interesting that he mentions that some people in his audience have asked, "Isn't this all a waste of time?" The author's response is that that person missed the point. Perhaps I did too, but I don't believe I did. This is one of the best books I have read for self development! I love the fact that the author backed up his ideas with specific examples. Another great aspect of this book was that some of the case studies were actually his own; many authors rely on other people's data collecting and rehash those results without having the information first-hand. His message was very upbeat, keeping his attitude in line with the title of his book. After finishing this book I can honestly say I feel more enlightened. With some books I merely hope for a few nuggets of good information; this one had a value pack of it. I look forward to reading more books by Shawn Achor. Happiness leads to greater success, not success makes us happy. Because top achievers like you are always changing and adjusting your goals, we create what Dan Sullivan calls “The Gap.” The GAP is similar to the horizon….you can keep driving forever, but you never get there. When we get to our “success,” we change what success looks like. As a result, most people don’t experience the true feeling of success; and if we have to be “successful” to be happy, we never get there. Our brains work in the opposite order. If you can raise the brain’s level of positivity or happiness in the present, then success rates rise. There is a new study in what’s called “Positive Psychology,” and it consists of studying why positive people consistently outperform the norm. So what causes people to be more optimistic? When our brains always look for the positives in everything the better you will feel, the more you concentrate on the negatives the more negatives you get. Just thinking about your favorite movie or happiest time in your life raises your endorphins. Our belief in another person life can bring that belief to life. We believe we can do more or when other believes that is when we usually do more. 1. Gratitude: Our brain is similar to a single processor for experiencing the world. If we are processing all the negatives (stress, bad relationships, world news), then our brain doesn’t have the resources to create a better future. Focus on the good stuff! 2. Social Support Level: This is the people you choose to have around you. Do the people around you support you with positivity? Research says that only 25% of success is predicted by intelligence and technical skills and 75% is predicted by social support! 3. Seeing Problems or Stress as Opportunities. People who see potentially negative situations as opportunities or a challenge have more optimism than those who see the same situations as negative. Optimism creates positive results. 4. Belief: Having the belief or faith that everything always works out like it’s supposed to provide optimism to everyday circumstances and situations. As a lead generation company, innovation and creativity are crucial for us to stay ahead of the curve. Its no surprise that this book dives into a few things we naturally do, because we happen to be positive people. Even more importantly, is how this book can be a tool to increase happiness (by applying some changes in ones life), how we can inject happiness more frequently to jump start creativity and innovation in the workplace, and this book has already helped define a few of the things we never articulated but truly look for in a good partnership or hire. 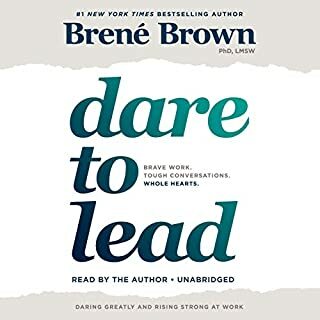 This was a great read/listen, with studies, scientific, etc... and if it were up to me, not only should managers and owners read this book...but high school freshman and sophomores as they begin to start wandering down career and college paths. It begs the question, do you want to get into a certain school, or do you want to be happy in life? This book has the ability to plant some major seeds to help prevent negative tracks in life that are hard to u-turn out of...2 thumbs up! This book puts compelling data behind many of the tools taught in Dale Carnegie's "How to Win Friends and Influence People", focusing on Positivity. The practical exercises in this book, particularly the daily What Went Well exercise, are deceptively simple yet so powerful. I have listened to the book several times, applied the exercises and introduced them to my workplace and the courses we teach with remarkable impact. For anyone looking to apply the techniques the I Journal app and daily reminder to do the What Went Well exercises also help. The stories are so well told by the engaging and often humorous author it's easy to get enthused by the material. The practical, evidence based and easy to apply techniques make this book stand out. While it might have just been a case of the right book at the right time, this book genuinely *has* changed my life, largely thanks to the passages on 'activation energy' - which were both revelatory and laugh out loud funny. 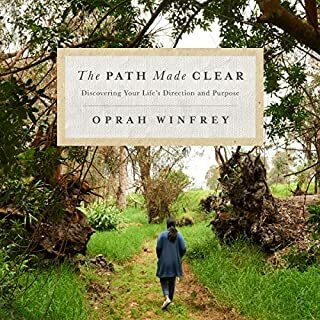 Achor is an understated, self-deprecating author/narrator who avoids the 'fluff' and focuses on the scientifically supportable and (more importantly) actionable aspects of positive psychology. Ignore the bit that says 'at work' - this book applies to all areas of your life. The author explains with great clarity and supporting scientific information the importance of positive thought. I found the advice on implementing positive and lasting change to be incredibly insightful and practical. I enjoyed this book so much that I've given it as a gift to quite a few people. 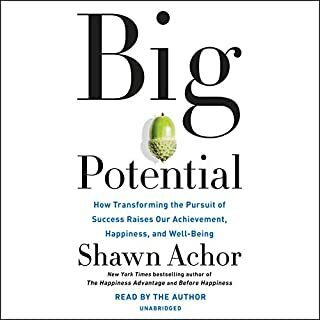 In a nutshell, Shawn Achor is a Harvard Graduate/Professor who specialises in psychology of the link between happiness and performance (or vice versa). He manages to successfully outline that link and gives you an easy-to-understand guide into how to become happier and optimistic so that you can go out and start achieving greater success. A very easy to listen and the results, for me at least, has been very rewarding. I am over half way through this book and I am struggling to pay attention! The content in general is quite good but the monotonous style of the narrative is a bit mind numbing. I keep finding myself drifting off and thinking about something completely different and then phasing back in to the realisation that the narrator is still talking! This is unlike me as I have a good attention span, especially for things I find interesting. This is a subject I normally would enjoy. The author / Narrator has also tried to inject comedy into the content, this in itself is a good thing, but the delivery is so flat and monotone that you don't even realise it was supposed to be a joke! A final criticism is the intense amount of statistics being quoted. Its like the author expects the listener not to believe what he is saying so he feels the need to bombard you with far too many statistics. Key statistics are helpful and re-assuring but this many is just annoying! If you could sum up The Happiness Advantage in three words, what would they be? What was one of the most memorable moments of The Happiness Advantage? Taking time out of each day to reflect on the things that have gone well, rather than the usual remembering the things that have been painful. What does Shawn Achor bring to the story that you wouldn’t experience if you had only read the book? This is a fabulous bringing together and ordering of a lot of the principles findings and research in the field of Positive Psychology. Like all the best business books you get to the end of a chapter and thinkl "but that is so obvious." Then you reflect and realise if it is so obvious why are you not doing it. The autor also gives some nice little tools to assist the reader in adopting the lessons learnt. For my money a must read for all business leaders and managers. I am a Clinical Hypnotherapist and Psychotherapist and bought this book to add to my library of similar titles. Some of the previous reviews almost put me off but I am SO glad that they didn't. The Happiness Advantage is well written, informative and pitched at a level that we can all get our heads around. The advice given is sound, evidence based and laced with personal examples and experiences. This is ideal for individuals looking for development, but I am also convinced that no matter what my line of business, or size of company, if I was the CEO I would ensure that EVERY manager within my organisation got a copy in their Christmas stocking. Get this book - get happy and get successful as a result! Good stuff: lots of evidence, from diverse sources. Plenty of anecdotes and examples. Not so good stuff: agree about the narrator, he just sounds as though he's 'phoning it in'. Shame, if Mr Achor speaks and does presentations, that he couldn't do his own reading, as I'm sure it would be a better listen. If you've read/listened to books by Martin Seligman, Jon Kabatt-Zin, Barbara Frederickson and Carol Dwek, then there's not much here that will be new to you. If you haven't this audio will serve as a useful intro. One of the self help books with bang up to date theories that make sense and easily digestable. What can be more important than being happy. Narrator is a bit monotone and you can find your mind wanders unless you concentrate. Besides that I can -happily- recommend this audiobook. will listen again though to try and gleen as much of this happy wisdom as i can.